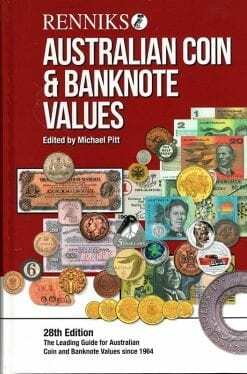 Polymer banknotes were a world first development by The Reserve Bank of Australia to make counterfeiting more difficult. 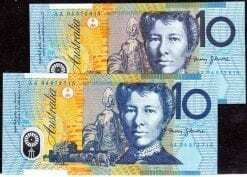 They engaged the Commonwealth Scientific and Industrial Research Organisation (CSIRO) and The University of Melbourne to that purpose. 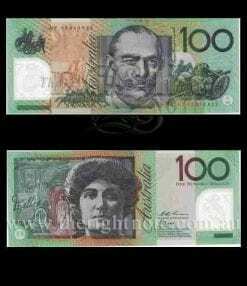 They were first issued as $10 notes in Australia in January 1988 to celebrate the bicentenary of Australia but had to be withdrawn due to faults. 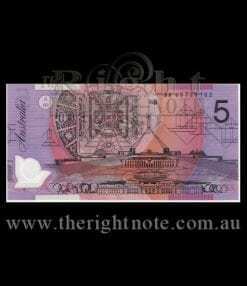 It was also the first banknote to feature an optically variable devise (OVD). They were re-introduce in Octover 1988 after correcting faults. 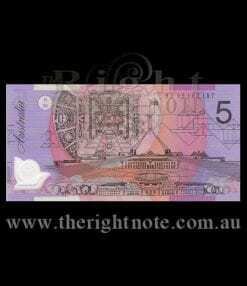 The Right Note has first run, un-circulated and sequential run Polymer Banknotes among our collection for sale. Renniks Number: R216. Code: BP9002. 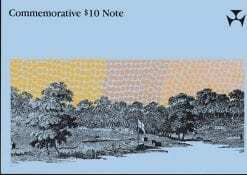 Denomination: Five Dollars. Signatures: Fraser/Evans. Circa: 1995. Serial Numbers: DC93 460056/57. Banknote Description: Fraser/Evans normal prefix 1993. Old colour Medium to dark green serial numbers Grade: FCU. 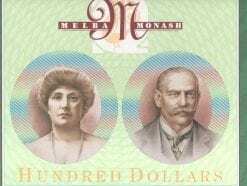 Flat crisp Uncirculated. RR: $150.00. Source: Renniks 28th edition 2018. 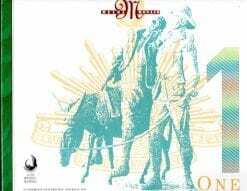 Available only as singles or pairs, due to limited stock. Renniks Number: R616f. 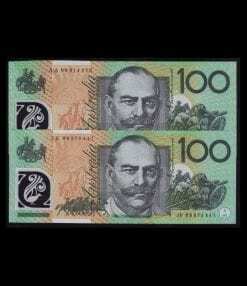 Code: SK9001 Banknote Description: One Hundred Dollar, polymer issue. Signatures: Fraser/Evans… Serial Number: AA96 974 243. Grade: Uncirculated. RR: $575.00. Source: Renniks 28th edition. Sale Price: $475.00. 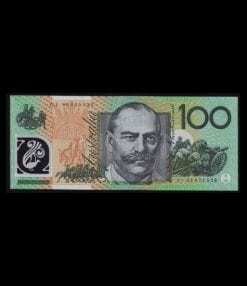 Save: $100.00. One Hundred Dollar. Last Prefix paper issue. First Prefix polymer issue. Code: TRN. Reference: Johnston/Fraser. Banknote Description: Australian Polymer Banknote Release. Signatures: Johnston/Fraser. 1988. Grade: Uncirculated. Code: TRN. Banknote Description: Australian Release Polymer Banknote. Signatures: Johnston/Fraser. Serial Number: AA23 101711. Last Prefix of the collector sets, issued. The collector set ranged in prefix from AA 00 to AA23 in 1988. We are advertising AA 00-28. 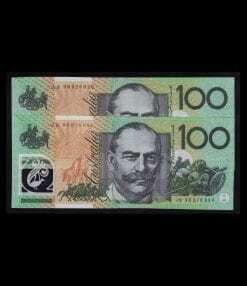 This banknote is very rare. Signatures:McFarlane/Evans. Serial Number: AA94 972 615.